What’s billed as “a variety show of veritable feats” that aims to revive Vaudeville-style theater in the state will make stops in six Iowa cities over the next several weeks. Producer Ian Miller, of Des Moines, is one of the creators and participants in the stage performance called “The Nitch,” featuring an all-Iowa cast of characters, poets, musicians, acrobats and more. 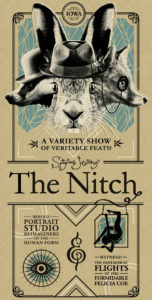 “‘The Nitch’ is a story, an adventure really, of the individual search for self-definition, using creative means to help define the individual,” Miller says. “We’re hoping that we inspire creativity amidst the viewing audience.” In the dramatic portion of the show, Miller plays a masked animal character who’s trying to read a book to the audience but he’s constantly interrupted by other pesky animals who aim to steal the book. The antics eventually result in an outbreak of pie-throwing. The messages embedded in the entertainment include an emphasis on the importance of literacy and individuality. 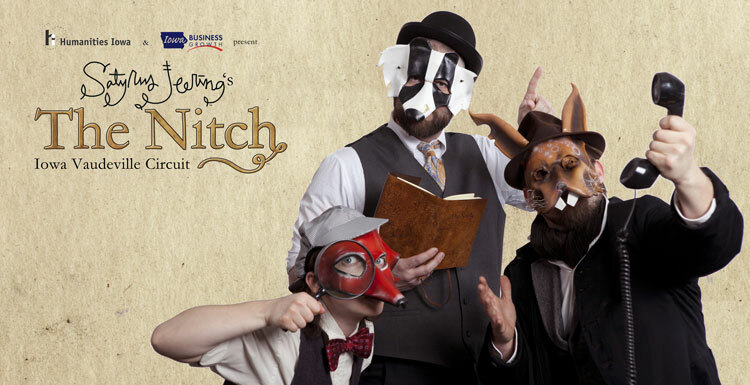 While it’s geared for a young audience, he says “The Nitch” appeals to adults as well. The first of the six scheduled performance is set for January 28th at the Hawkeye Community Theater in Fort Dodge. More shows are upcoming in: Corning, Keokuk, Greenfield, Red Oak and Elkader. Learn more at: http://satyrusjeering.com.